The London studio's interpretations of one of fiction's greatest cities are, without doubt, amongst the finest open worlds in gaming history. This article complements VICE's Open Worlds video series, and is made possible by NVIDIA. Watch the Batman: Arkham Origins episode, with freerunner James Kingston, here. Rocksteady saved Batman from the depths of video game hell. While that statement is quite deliberately hyperbolic, when you take a minute to think about it there's more than a moderate amount of truth in it. Long after we'd all experienced the delights of Batman Returns or Batman: The Video Game, there was a constant stream of garbage that no one in their right mind would ever claim as good. It's why most "Best Batman Games Ever" lists often throw some extremely average titles into the mix. You run out of choices very quickly. This, however, is why London's Rocksteady Studios deserve even more credit for the love, care and attention they gave DC's finest creation, introducing a digital vision worthy of The Dark Knight and going as far as to win over the Call of Duty generation. The Warner Bros.-affiliated company's Arkham franchise – counting 2009's Arkham Asylum, 2011's City and 2015's Knight (Batman: Arkham Origins being the work of Warner Bros. Games Montreal) – is one of gaming's most popular*, and a huge reason for this is the understanding the Rocksteady team has for the license. And this can be seen right across the three versions, the three visions, of Gotham it has presented to us since 2009. No area of Asylum, City or Knight has been created without ensuring essential elements of Batman are expertly woven into the mix. 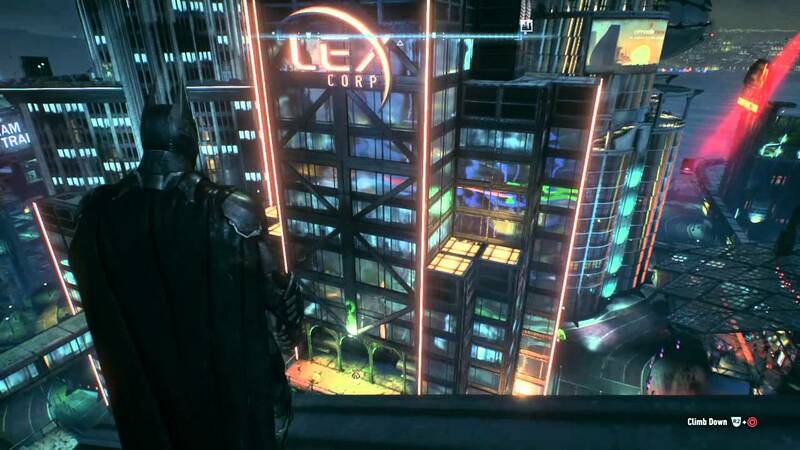 Be it the nods to Jason Todd or Hugo Strange in Asylum, Crime Alley in City, or the numerous Easter eggs relating to other DC characters in Knight – including a giant billboard for Lex Corp – Rocksteady found a way to make each a joy to exist within but also littered with landmarks that leave little doubt as to where you currently are. It's a world you've known and loved for years, skilfully brought to life from the latest minds to be given the keys to the city. That's no easy task either. Aside from competing with dozens of other interpretations and what fans summarise in their head, Rocksteady had the added obstacle of establishing Gotham as not only suitable for play, but also believable as a functioning city. Every road, feature and district had to effortlessly connect with the next, so that the original neo-gothic adaptation based on the darker side of America could be re-imagined as a space more than fit to house a game. It starts with Asylum, a far more claustrophobic and suffocating setting than its successors, but one that remains incredibly unique. Treated as an island off the coast of Gotham, Rocksteady's version of the home for the criminally insane is pitched perfectly. Allowing for the dark, tense and, frankly, disturbing moments that many of the best Batman stories embrace, Asylum is harrowing in places, largely due to the environment you find yourself in. The prison is not an enjoyable place to be, every corner potentially housing a threat or challenge. This is juxtaposed, though, with the mini open worlds that connect the individual wings together. The contrast is striking, especially when you first realise there's more here than just tight corridors – it's more evidence to how smart Rocksteady was in its approach. It's all pieced together exquisitely and, furthermore, completely designed to incorporate every Bat-gadget that's at your disposal. From the grappling hook –constantly impressive given how the trilogy is built, so that you never actually have to set foot on the ground – to the line launcher, nothing has been ham-fisted or squeezed in. It fits, because each part has been meticulously thought out. The next step was always going to see Gotham treated as more than just a pretty view, and Arkham City was an instant triumph. Constructed with the idea of letting you "become The Batman" – and honestly, who didn't suspend their disbelief with ease at least once? – it's a blueprint in how to build a playground without sacrificing years of lore and history, because everything's here: the aforementioned Crime Alley, GCPD, the Monarch Theatre, ACE Chemicals. All feature, and all exist to further the experience. You can brood on a clock tower or glide through the skies if you want, actively taking watch over Batman's domain. And guess what? You'll see crime ravaging the streets that you can swoop down to stop. You're not just playing someone else's game. You're stepping into someone else's shoes. That's just not possible without a living, breathing Gotham. Which brings us to Arkham Knight, the perfect showcase as to why Gotham's sole purpose is to bring a comic book character out of the pages. City's buildings and layout were undoubtedly put in place to allow Batman's more visceral qualities to come to the forefront. Whether you're descending from above to take an opponent unawares or flying over rooftops to further the story, this was the in-your-face Batman so many of us have loved reading about over the years. Knight ramps this idea up even further, creating a playspace that's specifically fashioned to allow a new addition to the series, the Batmobile, space to shine. Other games may have introduced the car in order to advertise such a fact on a box, but none have made it feel so seamless and important as to what is trying to be achieved. Even the geography of the roads and streets is a wonder to behold, giving you the opportunity to speed around Gotham as competently as any racing game. Certain disdain may be thrown its way in terms of questionable stealth sections using the heavily armoured vehicle, but chasing Firefly or ploughing through scenery that explodes on impact is a unique and exhilarating feeling that could have so easily gone wrong. It's just another example of how Rocksteady rarely screw up, unlike other developers who've had the same template to work with. They devised worlds that felt like Nickelodeon cartoons and vehicle sections that were borderline insulting. Just go spend a few minutes in the long-forgotten Rise of Sin Tzu. The exception to this rule is actually Warner Bros. Games Montreal. The Canadian team took what Rocksteady had carved out and ensured it didn't drop the ball, 2013's Arkham Origins not only adding further proof of how beautiful Arkham City is, but also how much mileage it's possible to get out of this world. Winding back the clock and showing a different side to the locale – the game is set five years before the events of Asylum – the real appeal is the areas you fondly remember. Much like your own hometown, you know the quickest routes and position of important monuments. You don't just walk around it. You live it, the added snow making sure while Origins might be considered the weakest of the Arkham games, it's still a memory lane joy. The ultimate praise, however, even with countless missions, thugs to punch in the face and iconic villains to track down, is that there's as much to take away from the Arkham verse simply by exploring what it has on offer. A simulator by any other name, each version of Gotham can be delved into as a spectator, holding a sense of satisfaction and entertainment that most games struggle to achieve at all. Rocksteady has proven time and time again that they're world-building extraordinaires. The fact they managed to do that while dealing with something as truly special as Batman is just the clichéd icing on the cake.